This area contains all our Mizuno Netball Stock items. 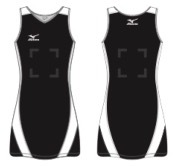 Cut & Sew Netball Dress with a V Neck. Also featuring moisture wickingand blindstitch properties. This is a UK Stock Product. MINIMUM ORDER IS 5 ITEMS. ORDERS NOT CONTAINING THIS WILL BE REJECTED. CUSTOMISATION (EMBROIDERY, PRINTING) IS AVAILABLE. PLEASE CONTACT INFO@GPETEAMSPORTS.CO.UK TO DISCUSS REQUIREMENTS. Single Colour Skort featuring moisture wicking properties.